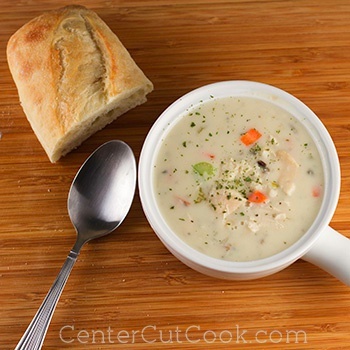 Slow Cooker Cream of Chicken & Wild Rice Soup is creamy, comforting, and so easy to make that there is absolutely no reason to run out to a certain “Bread Cafe” to get a bowl! I think the first time I ever had a bowl of Cream of Chicken and Wild Rice Soup was at that popular bakery…. you know… the one that starts with “pan” and ends with “era?” That one. I quickly fell in love with the comforting nature of a warm creamy soup, served in a delicious sourdough bread bowl.The kind of soup that when you eat it, for a minute, all is right in the world. Ever since, when I go to Panera, it’s a hard decision to choose between Cream of Broccoli and Cream of Chicken and Wild Rice Soup. Because I don’t like hard decisions, I decided I’d just whip up a batch of tasty Cream of Chicken and Wild Rice Soup at home so there’d never be a need to make that sort of life altering decision on the rare occasion I make it out to Panera. ;) And because I like “delicious” to be easy to obtain, I decided that the slow cooker would be involved! This slow cooker Cream of Chicken and Wild Rice Soup is everything it should be… creamy, comforting, loaded with chunks of chicken, carrots, celery, and wild rice. It takes all of about 5-10 minutes to prep, and the rest of the work is outsourced to the slow cooker! I’m sort of against outsourcing, but sometimes it’s necessary (and worth it!). Tonight there is snow in the forecast (booooo! ), and ice (extra boooo!). But, the good news is that I’ve got some leftover Cream of Chicken and Wild Rice Soup, along with some crusty bread ( a must-have with soup!) waiting for me. The snow blower is also waiting for me (errr… I mean my hubby) so that if the weatherman gets it right and we get as much snow as they say we will, clean-up will be a breeze. And speaking of a breeze… what I’d give to be in an amazing tropical location with a warm breeze! I need a vacation, how about you? Anyhow, in case you’re looking for some Cream of Broccoli soup, now that I mentioned it, you should probably checkout my version of Broccoli Cheese Soup, sort of like Jason’s Deli. Delish! In your slow cooker, combine chicken broth, water, package of Rice-a-Roni (including seasoning packet), carrots, celery, and basil. Stir to combine. Add in uncooked chicken breasts. Cook on low for 7-8 hours, or high for 4.5 hours. In a small saucepan, melt butter over medium heat. When melted, whisk in flour. Slowly, very slowly pour in half and half until well combined. Stir in salt and black pepper. Remove chicken breasts from the slow cooker and chop into chunks. Pour the creamy mixture into the slow cooker and stir to combine. Add chicken chunks back in and cook for 15 minutes longer. Makes about 10 cups of soup. Serve with crusty bread and enjoy!